The kids and I were very keen for a fish this weekend. But with the weather looking a bit of the ordinary side for a long run wide to the shoals, I decided to take them for a run over to the weedbeds to chase some Mackerel. Its definitely cold enough now, and even if the wind did come up a little we would have some good protection once inside the cape. So at 4.30am I drag Tania out of bed and get the kids ready. Tania wasn't keen for an early morning, and the 8ºC temperature outside didn't impress! But after a slow start we eventually made the ramp by 6am. It was quiet at the CG, and for a change we got a park easily! The run across the bay was surprisingly good. Not quite a glass out, but only a light ripple to break the surface. We sat nicely on 30knots all the way over and were soon anchored up with a couple of floating pillies out the back. Unfortunately it wasn't long and the breeze crept in. A good 10knots was soon pushing the boat in the complete opposite direction to the tide. This made fishing interesting, and after some frustration I decided to tie the anchor off to the rear cleat so we could at least fish out the back of the boat! I don't recommend this as in rough weather you can easily take a wave over the back, but despite the breeze on the water it was very protected and producing nothing more than a little chop. 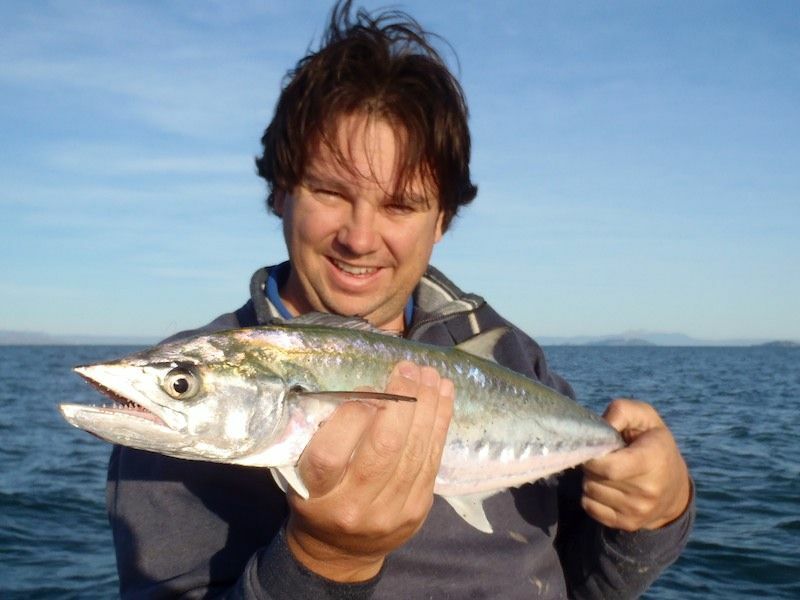 The mackerel soon made their presence felt as they started slashing at smacking the floating pillies. They were pretty consistent, but not biting their heads off. It didn't take long and we had soon gone through a bag of pillies and had 7 keepers in the eski. Numerous smaller fish were released and a few Wolf Herring also made their way into the kill tank. I picked up a few on a small bumpa-bar on spin, but they weren't thick enough for this to be consistent. With all the bait gone by 9am we decided to give trolling a go. So out went a couple of lures and we headed back toward Alligator creek. The wind slowly dropped off and eventually glassed out. For the next 2 hours we consistently pulled in grinner after grinner! 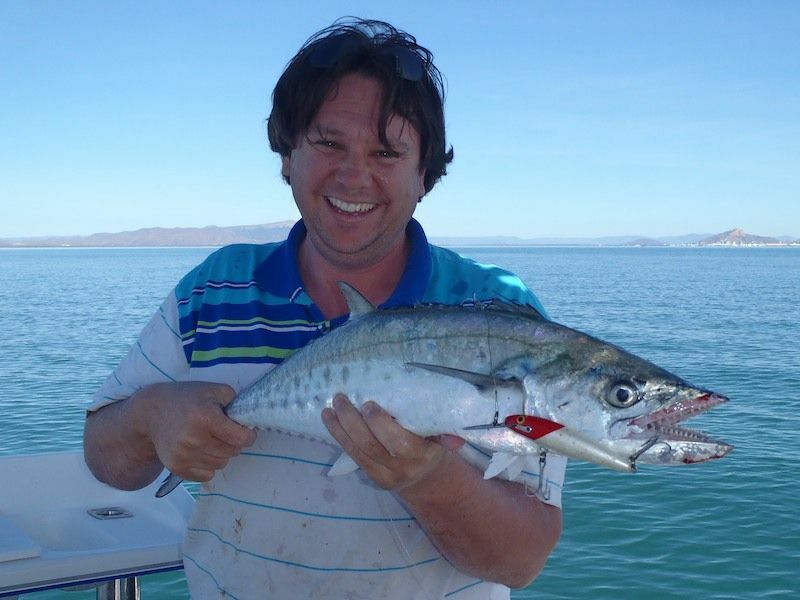 But in-between another 4 Mackerel were added to the eski. The biggest fish of the day, about 70cm, fell to the trolled lure.